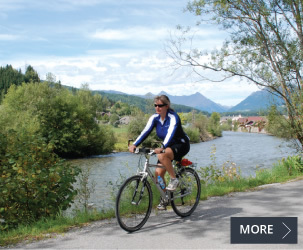 Cycle Breaks are specialists in self-guided cycling holidays and bike tours in the UK and mainland Europe, including France, Austria, Germany, Italy, Spain, Portugal, Holland and Norway. 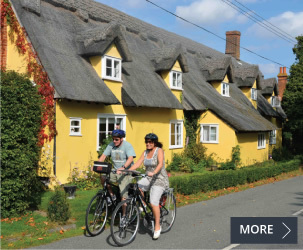 In England we organise cycle tours in our native East Anglia: Suffolk and Norfolk. Operating since 1991, we offer a high level of personal service and extensive experience. We love what we do, and it seems that our customers do as well. 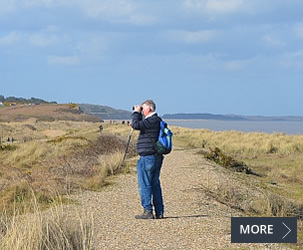 Our gentle adventures take you to some of the most inspiring places in England and Europe. We’re sure you’ll unwind as you turn the pedals, but our aim is for you to relax before you even arrive. We take care of everything, kitting you out with a good quality bike, providing detailed, well thought-out itineraries and maps, booking your accommodation and organising luggage transfers. And just in case your bike chooses not to go that extra mile, we provide an en-route support service too. Coast along in Suffolk perhaps. Wheel around the waterscapes of Venice and Valencia ; discover the treasures of Tuscany or Baroque beauty of Puglia (Apulia). Dream a while on a bike and boat by the Danube, along the lowland waterways of Holland and Flanders. Clock up a kilometre or two around Norway’s Oslo fjord or in France’s Châteaux country of the Loire. You can country-hop around Lake Constance on our real cosmopolitan cycling holidays, cycle superbly in Italy’s stunning Piedmont region, coast it in Catalonia, go wild in Valencia’s Albufera Nature Reserve or along Portugal’s west coast and the Algarve, or enjoy island life as you cycle around Mallorca. Why not try a refreshing weekend break on the French Atlantic Coast, taking in La Rochelle, Rochefort and the beautiful cycling island, Ile de Ré? There are boat and bike tours along classic coast, river and canal stretches in the Netherlands and Belgium around Noord-Holland and between Amsterdam and Bruges. Down in Provence, there are some refreshing ideas too, where our bike and riverboat holidays offer you moorings from historic Avignon and Arles to the Rhône delta and Camargue near Aigues-Mortes. Wherever you choose to push your pedals, our cycle tours are designed to let the beauty of the scenery and immediacy of the culture take your breath away, rather than the physical activity itself. Ranging from just a few days to a whole week or two away, our UK and European cycling holidays are generally suitable for would-be cyclists of all ages and abilities and many make great activity getaways for families, extended families or groups of friends. From advice on seamless trousers and gel saddles to arranging well-located and relaxing accommodation, we make it our business to ensure that your holiday is comfortable all round. Our route notes give plenty of tips for stops and sustenance along the way and there are suggestions for supper places too on breaks where dinner is not part of the package. What’s more, all of our tours are graded so you can select the one that’s right for you, or chat things over with us, if you prefer. All our itineraries come with route options, long or short cuts. Part of the appeal is that the pace of your break and the distances you cover are your choice: you can be as active or relaxed as you wish, visit the sights you want to see and enjoy every minute of your holiday. We hope you’ll take up our invitation to stretch your legs in the gentlest of ways. To take time to look up and breathe in. To cycle even a little and experience a lot. To enjoy your very own gentle adventure and to feel better for it.